Walter Walsh warming up before Sunday's clash against Limerick. JACKIE TYRRELL MAY may think the reigning champions Limerick are not a top three side, but his former Kilkenny teammate Walter Walsh disagrees and believes that John Kiely’s squad is ‘right up there’ among the best and will be hard beaten in 2019. In the lead up to Sunday’s Allianz Hurling League meeting between Kilkenny and Limerick, nine-time All-Ireland winner Tyrrell predicted the downfall of the Treaty men, but the manner of their 2-18 to 0-15 win at Nowlan Park suggests the champions have maintained the standards which took them all the way last year. Walsh made his comeback in that game and the 27-year old was impressed by the way Limerick have started 2019 with three wins from three as they top Division 1A. But the three-time All-Ireland winners also thinks there is also a lot of teams near the same standard in the chase for Liam MacCarthy honours. “Look, it’s kind of hard to know who is where. Looking at yesterday’s performance Limerick are definitely right up there,” said Walsh, who is a teacher at Good Counsel College in New Ross. “It is February now, but they are playing a great brand of hurling. They are extremely organised and they will be there or thereabouts. “The way it is there is nearly a top eight or nine teams, that’s kind of the way to is in hurling at the moment. It is seriously competitive. “Maybe ten or 15 years ago there was more All-Ireland teams coming back after enjoying the celebrations. But it’s gone so competitive now. Even in the Limerick squad the guys are pushing each other and driving each other on. They all want to be on the team. “You see that when Galway won last year as well. They came back in great shape as well. You kind of have to. If you don’t, the league, you won’t be that competitive in it, and that might follow on into the championship. 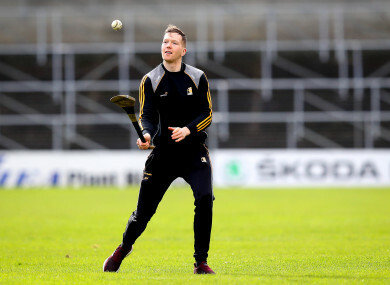 A home defeat in Nowlan Park is never digested well in Kilkenny, and Brian Cody’s side will hope to improve their one out of three record this weekend when they make the trip to Thurles to face great rivals Tipperary. Neither side have shone brightly at this early stage of the campaign, but Walsh sees this game as a chance to pick up a win that could propel them on to further success. “It’s hard to judge how we are at this stage. We have won one game in three and that’s what you look at. We have blooded in a lot of younger players as well, which a lot of teams have done. “Looking back if we win now on Sunday we are in a totally different scenario. You’d have a good chance of getting in the top four and anything can happen from there. “Last year we lost our first two games and we won every game after that and ended up winning the league. If you get a bit of momentum anything can happen. “Naturally enough you lose a game you are going to be disappointed. Most players at this level, you hate losing anything. It was like that, everyone was disappointed, especially seeing we were playing on Nowlan Park. “In your home ground you want to be winning those. You want to win every game but you don’t want to be losing home games. There is something about that as well. “There was no chairs being thrown, as you said, but there was definitely some positives to be taken from the game. We have plenty of areas to work on. “Limerick were better on the day, they beat us on the day. You take it game by game. The ambition for this year is certainly to win the league and win the All-Ireland. Email “'Limerick are definitely right up there' - Walsh disagrees with former team-mate Tyrrell”. Feedback on “'Limerick are definitely right up there' - Walsh disagrees with former team-mate Tyrrell”.